We've been enamoured of boats named "Proteus" ever since that movie Fantastic Voyage decades ago. 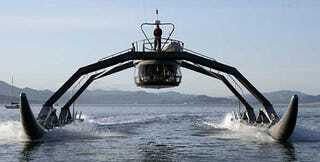 Now this Proteus is real, scooting around San Francisco Bay last week like some kind of water bug. The 100-foot catamaran was built by Silicon Valley big wigs, and has inflatable hulls that draft just a foot of water. Proteus owners say the prototype cost less than $5 million to build, but much of the raw materials were donated. No word on retail price or when the boat might be available for the rest of us, although the Coast Guard was seen sniffing around the demo last Thursday.